During my time working as a film journalist for over a decade, the world of film and football only crossed over very occasionally. There was the odd interview with football legends like Pele and Eric Cantona when they had a project to promote, or when chatting footy provided some rest bite for actors from talking about themselves or some mediocre film they just did for the money. I remember actor and Liverpool fan, Clive Owen gushing to me so much about Ashley Young’s injury-time winner for Villa against Everton in the classic 3-2 Goodison win a few years back, that it ate up a good five minutes of our interview time. On the day Villa signed Shaun Maloney from Celtic, I happened to interview actor James McAvory, who being a massive Celtic fan, gave me a good lowdown on Villa’s new acquisition. I also recall discussing the merits of Martin O’Neill’s management of Villa with scouse actor Stephen Graham over apple pie at the catering truck on some naff Nic Cage film set on location in Budapest. Decent films related to football are even rarer than such conversations though. Doing a fictional football film is difficult as they tend to end up like Roy of the Rovers, where you know the protagonist or team will triumph in the end. The best hope you have of a worthwhile big screen football fix is a good documentary, and the best one I’ve seen in recent years has been Jack to a King. Directed by Marc Evans (Snow Cake, Patagonia), the film charts the resurrection of Swansea City from a team in danger of slipping into non-league oblivion and going bust, to then rapidly rising through the ranks to reach the Premier League. A journey that spanned a decade. 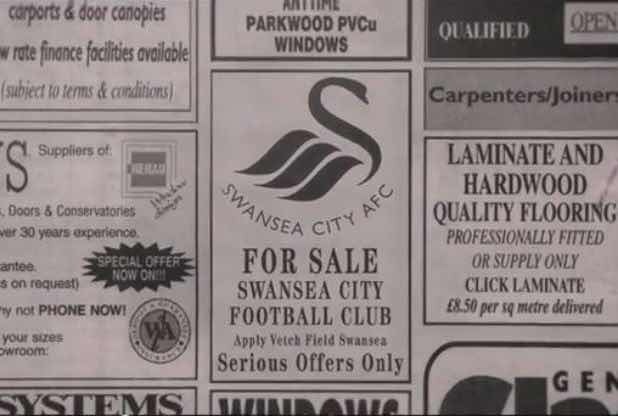 The heart and soul of both Swansea’s revival and the film is the Swans supporters, who become the real characters and raconteurs in Jack to a King. As chance would have it, after its successful cinematic release in September, the DVD of the film releases the day of Aston Villa’s Boxing Day trip to Swansea, so MOMS decided it would be a good idea to have a chat with our sole (& soul music) Swansea City buddy Abigail Davies, about both the upcoming game and the film. As well as helping out in the Jack to a King‘s production and starring in it (she has some of the best lines), all-round good egg Abi also writes about the Swans for Shoot Magazine and contributes to BBC Wales on their fortunes too. MOMS: I remember interviewing director Marc Evans a few years back and I vaguely remember him mentioning an idea of a football film, which obviously turned out to be Jack to a King. How did you get involved in it and was you easily persuaded to be in it? Abi: I met the Executive Producer, Mal Pope, whilst working on a BBC Radio Wales show, we were both on as guests to talk about Swansea City. A few months later, he phoned to ask whether I’d like to be in the film and subsequently, whether I would like to take on the role of social media manager. I didn’t take much persuading at all, I knew from the outset that it was going to be an incredible project to be involved in. The film after a successful cinema run, ironically releases on DVD on the day of the Swansea vs Villa game. What’s been the highlights of the film and your involvement in it, so far? It’s almost as if this was planned! One aim was for the input and significance of the fans to be reflected in Jack To A King, and I think it is, perfectly. For me, learning new skills about the industry has been hugely fascinating. I’ve worked with some wonderful people and just watching the film grow from an idea, to the highest grossing UK football documentary of all time, has been amazing. What’s the best thing someone told you personally about the film? In the film you mention a change to your breakfast routine before the Swans Championship playoff game vs Reading…so what does vodka (instead of milk) on Weetabix taste like? Haha. Of course normal vodka on normal Weetabix would be ludicrous, it has to be raspberry vodka on chocolate mini Weetabix, which actually tastes quite nice. It lines your stomach and calms your nerves, two birds, one stone! Have you tried Vodka in any other culinary dishes?! I can’t say I have, although I can tell you that Baileys in porridge is divine during the winter months! I loved the appearance of Roberto Martinez’s parents in the film. Do you have any favourite moments in the film, aside obviously from your own appearances? I really like the part where Martin Morgan speaks about how he thought he was going to be the first person to be sick in the director’s box at Wembley! I also like the contrast between Huw Jenkins’ parents and Martinez’s. The insight into Martinez’s childhood and upbringing was really great. They are all fantastic people! Certainly Jack to a King is a cautionary tale and through it you certainly see an increased bond between the club and it’s supporters, a state of affairs that seems to have reversed for most supporters of other clubs in recent times, with Villa being an example from our own experience. Does that kinship between Swansea and their supporters still exist or has life in the Premier League altered it in any way? I felt that when Michael Laudrup was in charge, we started to lose that connection. It didn’t feel like it was our club anymore. Our identity and core beliefs were in danger of being altered and removed. I felt that we had too many egotistical characters at the club who weren’t representative of what Swansea are about. Thankfully we have a chairman and board of directors who are passionate about this club and in Garry Monk we, once more, have a manager who will ensure players know what this club means to the fans. I think it is something that certainly sets us apart from other clubs in the division. A mutual respect like no other. Swansea still has their Supporters Trust owning 20%+ of the club, do you feel the impact of that as supporters? If yes, how so? Definitely. The Trust still holds Fans Forums which allow Swansea City fans the chance to ask Huw Jenkins and other members of the club questions, and express any concerns that they may have which again, helps make the fans feel involved.